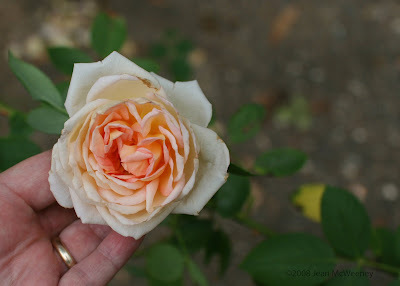 It's Garden Bloggers' Bloom Day and what's blooming in my garden? Well, let's see. It's October in the South so that means... roses of course! The rose at the top is the floppy-headed 'Janet', a David Austin rose. I've got a recent post about this one. Next comes "Veteran's Honor", one of the few hybrid teas that I've ever grown. 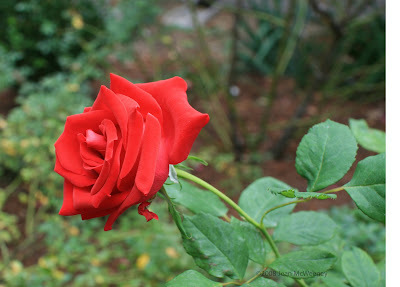 I like the wonderful fragrance and long stems but like most hybrid teas I've come across, it's a rather weak plant. 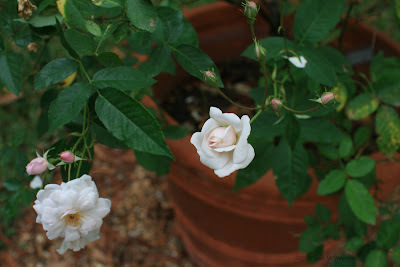 Now one of my favorite little roses, "Marie Pavie". Very fragrant, beautiful little buds, and almost always blooming. It tends to suffer from blackspot occasionally but it keeps on going. For years I had it in a large clay pot in Austin because we had terrible soil. When I moved here I was excited to finally give it a home in the ground. Well guess what? It didn't like it! And since I had to move it anyway when we put the new beds in, I decided to put it back where it was happiest, in a clay pot. And it's stayed there and thrived. There's a few other things blooming as well. Below is a little burgundy and gold combo that I didn't really plan. 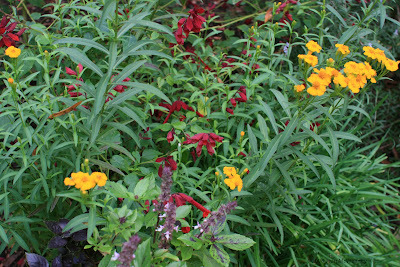 It's Salvia Van Houtii ‘Burgundy’ in the background, Purple Petra basil in the foreground, and the gold coming up in between is Mexican Mint Marigold, otherwise known as Tagetes lucida. This plant is a good southern substitute for tarragon, which tends to melt here. 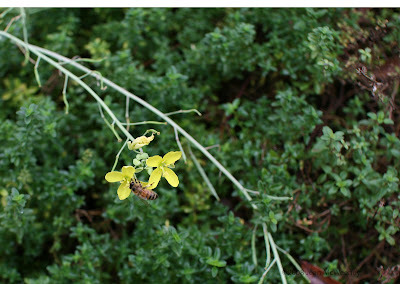 My "wild Italian arugula" is blooming and attracting all kinds of bee activity. That means I should have seed pods soon, which will disperse and pop up little arugula plants here and there. By the way, if you're a fan of arugula, you MUST try and find this kind. It's really delicious and totally unlike the rather boring arugula you find in the grocery stores. The potted pelargoniums are still blooming away as are the mums (that I didn't grow but instead bought at the feed and garden store). Alyssum is making a comeback and the A.J. sedum is still strong. And I'm still getting lots of little 'Sun Gold' tomatoes, yippee! Mine are done for the year - we've had such hot, dry, windy weather that nothing is in bloom for my first 'Blooms Day', unfortunately. And I love the burgundy/gold combination too. Sometimes the best stuff is unplanned. That's a shame about your first Blooms Day Chloe. Gardening's a tough business sometimes. Maybe this means your next fall will be much better. I'll have to remember that October means roses in the south. In my garden there are just a few straggly rose left. Isn't Marie Pavie a terrific rose? I have mine in the ground and it has never given me any problems. I just love it. I've had so-so results with the Austin roses but I'm always wanting to try more. They look so beautiful in the catalogs. I've ordered 'Heritage' and 'Graham Thomas' this year.